It’s not easy to run a restaurant. But small business owners should keep a checklist of tasks to complete to help ensure their success. I called NuVegan Cafe and their mailbox was full and not taking messages for more than a week and nobody answers the phone. I tried to send them a message via their website and repeatedly received a captcha error and thus couldn’t email them either. If I was contacting them to cater an event, they could have lost thousands of dollars in business. First impressions matter. With plenty of other choices to visit, I could have easily opted out. It’s critical that restaurants maintain their website and other communication channels by checking them frequently to ensure they’re operational. 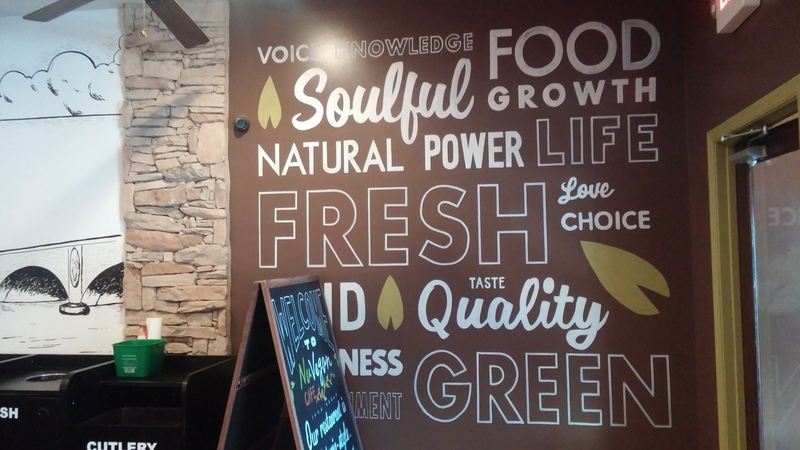 Fortunately, my visit to NuVegan Cafe, a 100% plant-based soul food restaurant located in D.C.’s Park View neighborhood and a stone’s throw from Lincoln’s cottage, was markedly better than my fruitless efforts to reach them. It was created by husband and wife Vernon and Mickiyah Woodland. She who was born and raised vegan in Bermuda where her parents owned a vegan restaurant. When they married 14 years ago, Vernon made the transition. Although off the beaten path, NuVegan Cafe is easy to find and stands out in a neighborhood where vegan food isn’t the norm. This place doesn’t mess around with their mission either. It’s plastered all over the restaurant. They want everyone to know they’re vegan and they care about animals, the planet, and people. The team successfully shreds stereotypes by showing customers they can eat the food they enjoyed growing up without harming others. I was confused why they write “Soy” or “Soy-Free” under each item on the menu. It needlessly draws attention to soy which has had its reputation erroneously, intentionally, and successfully sullied by the meat industry to persuade people that it’s unhealthy to eat so they’ll buy meat. A nonprofit medical organization that doesn’t stand to gain financially from people not eating it has documented the truth about about soy. People can’t believe that health messages would be so duplicitous so they subscribe to peddled myths by the animal agriculture industry and the U.S. federal government. Soy is healthy to eat. If they’re posting it on the menu for people with allergies, I recommend they simply use the “SF” abbreviation for soy-free options so it doesn’t dominate their menu. The NuVegan Cafe website is eye-pleasing and engaging and their prices are extremely reasonable. The 100% vegan menu includes fried steak, barbecued tofu with rice, chick’n tenders, lasagna, fried fish, crab cakes, fried chick’n, steak and cheese sub, quinoa burger, cheeseburger, cheesy grits, sausage, omelette, french toast, waffles, cornbread, and dozens of other plant-based choices. They also make fresh smoothies and juices. I’ve never seen such a huge and diverse menu. It belongs in the Animal Rights Hall of Fame. When I entered the restaurant, I was greeted by Emmett like I had Willy Wonka’s last golden ticket. Emmett is a high energy superstar. I would hire this young man in a New York minute. He was smiling and enthusiastic. He introduced himself, talked to me about how the restaurant works (customers go to the back to place their order, pay, and then seat themselves), and offered to answer questions. He emphasized NuVegan Cafe’s mission and stressed that everything is vegan. Emmett is only 18 years old! I told him I see greatness in him. Before I ordered, I spoke with the manager Lenora. 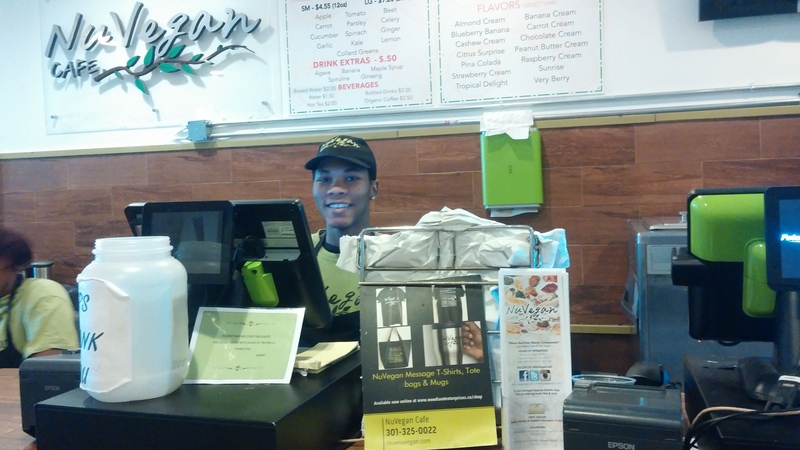 She was pleasant, knowledgeable about the food, and eager to tell the NuVegan Cafe story. 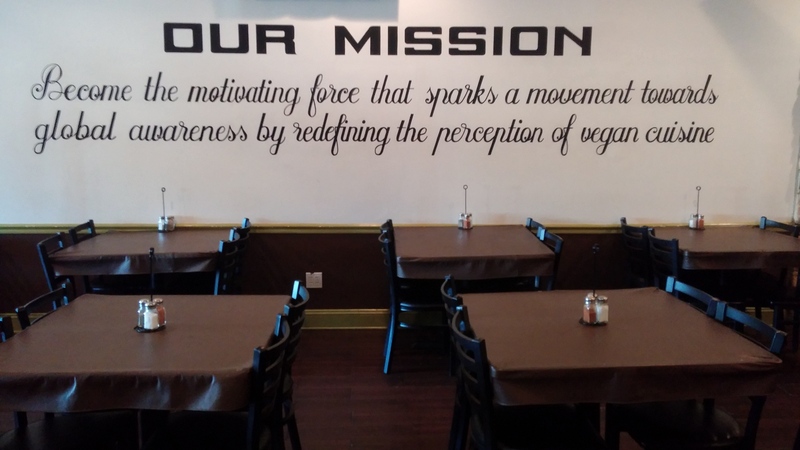 It didn’t take long to realize that the culture at NuVegan Cafe matches the mission. Lenora told me they serve mostly meat eaters who can’t resist their delicious food. They’ve successfully managed to replicate the taste, texture, convenience, and affordability of animal-based food. For more than 10 years, they’ve been making a difference in their community by showing people how to eat with a conscience. I grew up in New York so not so much on soul food. I cook all of my meals at home and I eat all whole foods with no oils and nothing fried so this isn’t my typical fare but it’s the type of food that millions of people eat so it’s critically important to have restaurants like NuVegan Cafe. But there are also plenty of sides and even entrees that are healthy so there’s something for everyone. I tried the fried chicken and suddenly felt like I was born and raised in New Orleans. I could hear Otis Redding singing as I took each bite. I’m proud to know the good people at NuVegan Cafe. I’m grateful for what they’re doing to change people’s perceptions about vegan food and I’m inspired by their determination to save lives. If you’re in the neighborhood, I recommend dropping in for some southern hospitality and soul food. i agree on the nonscience regarding Soy. My sister-in-law had breast cancer & the doctor told her not to eat any soy! Crazy! I’m pleased you’re drawing attention to the responsiveness of businesses to client contact. Nothing is more frustrating than not getting a reply to one’s query. Also agree about the nonsense peddled regarding soy products. If there was something wrong with soy, millions of Asian people wouldn’t thrive on it! Love! Love this place!! Some of the best!